I was in Seattle, Washington today three years ago in my last lag of JetBlue AYCJ trip. I had featured a postcard of Space Needle, the landmark of the city before. However, the most photographed attraction in Seattle goes to the rotating pink Elephant Car Wash sign, as shown on the postcard US-2283455 to Germany. 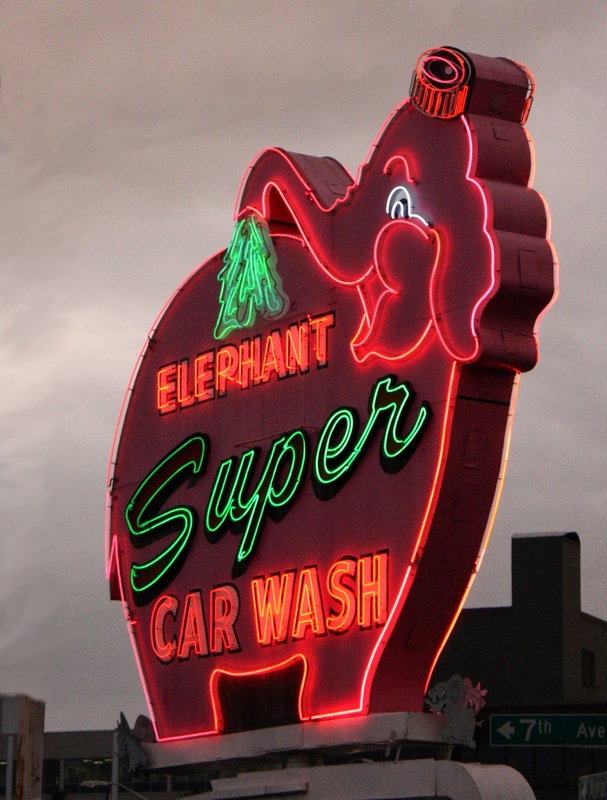 The business Elepant Super Car Wash started in 1951 with locations in Washington, Arkansas and California. This particular location at the intersection of Battery Street and Denny Way opened in 1956. There is a nice photo that shows both the Space Needle and the pink Elephant Car Wash sign in the Most Photographed Attraction in Seattle blog. Gabriel Campanario also has a cool sketch of the sign.